Shannon Patrick is stitching together a new future for herself and her children with a clothing line bearing a logo designed to appeal to everyone. In February, she placed third in a Pitch Competition in Battle Creek sponsored by Sisters in Business, a regional nonprofit organization that provides funding and resources to women of color entrepreneurs. The honors came with a $500 prize and a rent-free cargo container at the downtown BC Cargo complex, which Patrick will be able to use as a storefront for her business. Alisa Parker, an attorney with Legal Services of Southcentral Michigan, who founded Sisters in Business with her three sisters, says Patrick was not one of the six finalists originally selected after applications were reviewed. Members of the community who attended the pitch event helped to select the first-, second-, and third-place winners. Were it not for the appeal of her product to those making the finalist selections for the competition, Patrick may not have won. Getting up in front of a roomful of people to make her pitch was not easy for Patrick who admits to being shy. Looking back, she says she’s glad she did it because it paid off in the form of funding and resources that she didn’t have access to. Parker says Patrick is among the fastest-growing demographic of entrepreneurs. Parker’s youngest sister, Nicole, wrote a thesis while working on her Master’s degree at George Mason University, and information she gathered for it shows that black women represented the fastest-growing segment of entrepreneurs in the United States. Parker also says failure in business is looked at very differently – usually in a harsher and more negative light – when it’s a person of color that has failed. She says there is a fair amount of systemic racism in the business startup ecosystem and cites the example of the crooked road theory that came to light when World War II veterans were put in a room where all of the items were crooked. After Nicole Parker graduated she moved back to Michigan and contacted her sisters to see what it would look like to create a space for women of color who wanted to start a business or grow an existing business. The four siblings embraced the concept which became Sisters in Business. In December 2017, Sisters in Business officially kicked off with a brunch in Kalamazoo that was attended by about 55 people. The majority of the women who attended that first meeting all had their own businesses, which were not sideline or hobby enterprises, but were their main businesses, a fact that mirrored national trends. When Shannon Patrick won a Pitch Contest she also won space in the BC Cargo Pop Up Shops.This myth is exacerbated by misconceptions that there can only be one business that offers a particular service because there won’t be enough demand out there for multiple businesses offering similar services. Parker says this is a narrative that needs to disappear. “We need to get rid of this narrative that only one person can do this. We can all be doing something and all be brave,” she says. “One of the things my sisters and I laugh about is when we see a couple of yoga studios on the downtown Kalamazoo Mall, they’re all doing fine and offering similar services. Following that December gathering, Sisters in Business held another event in April 2018 which drew more than 100 people and caught the attention of Valerie Byrnes, Business Retention and Developer Manager for the Small Business Development Fund with the City of Battle Creek. Byrnes says aligning with Sisters in Business fits with the overall mission of her organization -- to launch and help grow small businesses throughout Battle Creek with a focus on underserved populations that have barriers. She says she wants individuals to view the Small Business Development Fund as a resource that wants to engage with would-be entrepreneurs where they’re at in their journey. In addition to Patrick’s prize money, cash prizes were awarded to the first and second place winners respectively. The prize money was provided by the SBDF and BC Vision. Byrnes says the Sisters in Business initiative provides additional ways to connect to resources, particularly for the city’s African American community. Starting in October, Sisters in Business began hosting monthly meetups which were two-hour sessions focused on providing knowledge and resources to women of color in Battle Creek who were interested in starting their own business or growing an existing one. Parker says these meetups were a lead-up to the Pitch Competition which took place in February to coincide with Black History Month. Having access to this type of support and the resources that come with it has been invaluable to Patrick who has gone through some tough times to get where she is now. To support herself and her children, Patrick works part-time as a literacy tutor at Valleyview Elementary School and fulltime at a cleaning business she started before her MS diagnosis. 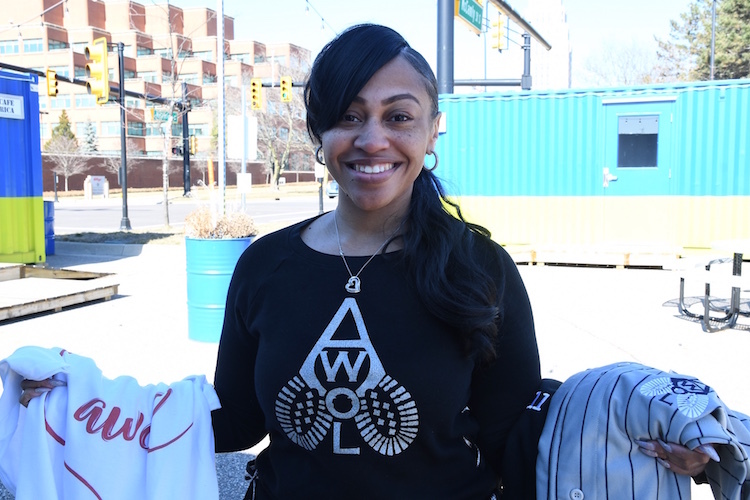 She has been selling her AWOL line via a website and Facebook. Shannon Patrick shows some of her clothing brand.After her MS diagnosis in 2014, Patrick says she had a lot of downtime. The illness affected her vision making it impossible to drive or do much of anything. She and her children moved in with her mother and Patrick says she began to become very depressed. In addition to her illness, Patrick was has navigated parenting as a single mother. One of the fathers of her children was murdered and another is serving a 20-year prison sentence. She started writing her new story in 2017 when she took a leap of faith and began AWOL with no formal training in the apparel industry. Currently, she purchases items of clothing wholesale and brands them with her logo, she also will put her logo on articles of clothing furnished by customers. Eventually, she would like to start making her own clothing to sell and brand. Casualwear such as jogging suits or yoga apparel are at the top of her wish list. “I’m taking lessons from a lady who is teaching me how to sew,” she says. Her cargo unit at BC Cargo will be stocked with shorts sets, T-shirts and tank tops. She plans to take custom orders with a two-week turnaround. Byrnes said Patrick is the type of business owner who fits well with the BC Cargo model. “Shannon had already started to launch her business in an online forum and was testing the market,” Byrnes says. “We saw this as an opportunity to help her grow that business. 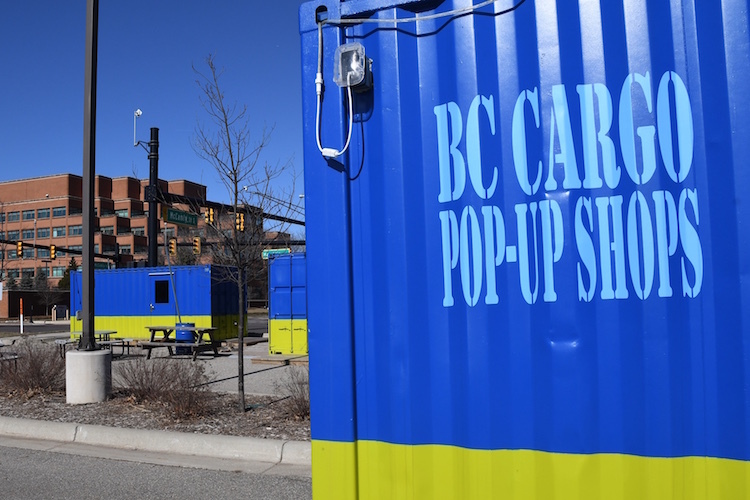 What I like about BC Cargo is that it’s created as an incubator of sorts. It’s low-cost with a short season. It provides a test market and allows entrepreneurs to get good at their system of operating. Patrick says AWOL is less like a job and more like an outlet and release for her. She says she is looking forward to having a space where she can really showcase what she does. “It always feels good when someone can see your vision,” she says. Photos by John Grap of John Grap Photography. His work is featured here.